Maroon Bells Wilderness: September 2015. 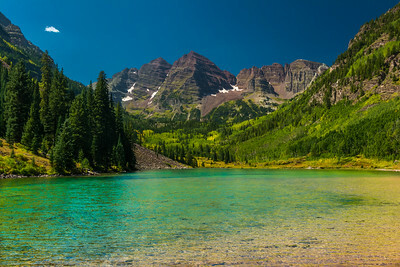 Maroon Bells is just one those locations that I have been patiently waiting to visit for quite a few years now. 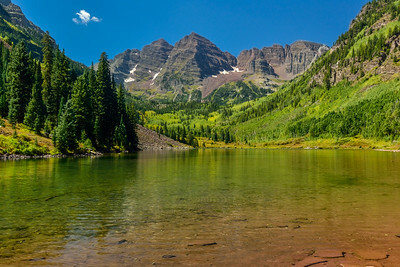 Although heavily photographed to the max, I feel like a highly popular scene like Maroon Bells (or any location for that matter) can get a fresh new perspective from a new set of eyes. However what I was not expecting, was the large crowd of visitors hiking and visiting Maroon lake on this morning. This led me to having to change my composition to a more “telephoto” feel for the scene, for what is not in view (and to my right) is the large amount fishers and visitor’s taking in the view along the banks of Maroon lake. It was well worth the wait. Thanks for looking! 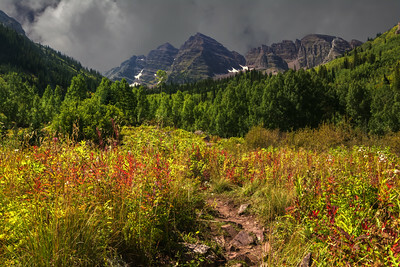 Maroon Bells, as seen from the scenic loop trail. Prior to this photo being taken, I had spent a considerable amount of time in the aspen grove that one can see in mid-frame. As I hiked back to Maroon Lake, I stopped to take a breath, which ironically led me to photograph the Bells from this spot on the trail.